There are many subjects that are interesting and worth exploring as a painter… landscapes, portraits, still life and abstractions… they, like any subject offer endless varieties of ways to put them to canvas. Then there is the subject that one day speaks to you alone, in a language that seems was made just for you to understand just enough, to make you want to learn more. A subject that seems to fit all your expressive wants and needs. That is how it felt when I first laid my eyes and opened my mind to layers of beauty, the peace and serenity and the vast artistic potential of the koi pond. When I first experienced the charm of the Koi pond (and many others will agree) I was struck by the sense of calm and tranquility it bestowed upon me. It was always my goal to make art that would not only come out to greet the viewer but also make a positive and lasting impression on the viewer. I knew at that moment, that this was a subject that I would want to paint and explore again and again. It was clear from my first attempts at painting these tranquil watery scenes, that it would be a challenging essence to capture. I also realized that the koi, are a far more complex and diverse subject than I thought. Having a rich and colorful history and a close relationship with humans, they have proven to be worthy of the time and efforts that I have put into capturing their essence on canvas. 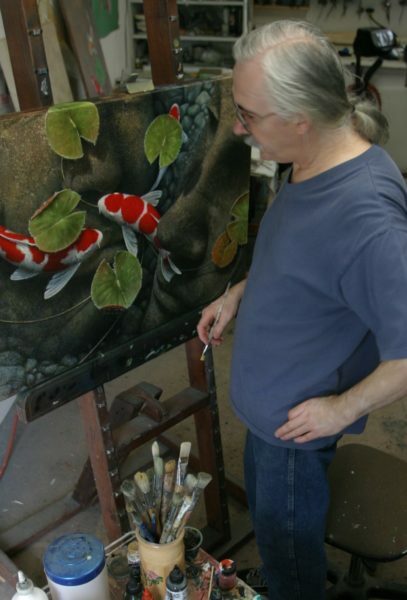 Even after years of dedicated painting and exploration of the Koi and the world they live in, the subject continues to provide me with an endless source of ideas and concepts to paint. The journey has revealed great creative freedom and depth, allowing me to blend the surreal, the real and the abstract visions and thoughts that gives my art it’s voice and distinctive identity. Countless people around the world and from all walks of life have been touched by these colorful descendants of the humble brown carp. Both the Koi and their history are colorful indeed, as it is a creature whose origins, evolution and diversity is so deeply and symbolically ingrained with us. Without our presence in their world, the “Koi” species we know today, would probably never have evolved to become the diverse and beautiful creatures they are today. Like most normal kids… I never really put much serious thought into what I wanted to be. I liked making art and making music going into high school and found myself in a situation where my aptitude for art, and my attitude for conventional education collided. The resulting explosion propelled me hundreds of miles away from my friends and family and into a college commercial art program. By the time I hit my 19th year I had my diploma in hand and a desire to make art for life. I went right to work as a sign writer and free lance commercial artist. I learned early that art was made best, when there was a balance of discipline and joy. When I went out on my own a few years later, I also learned that “necessity” was indeed the mother of invention. 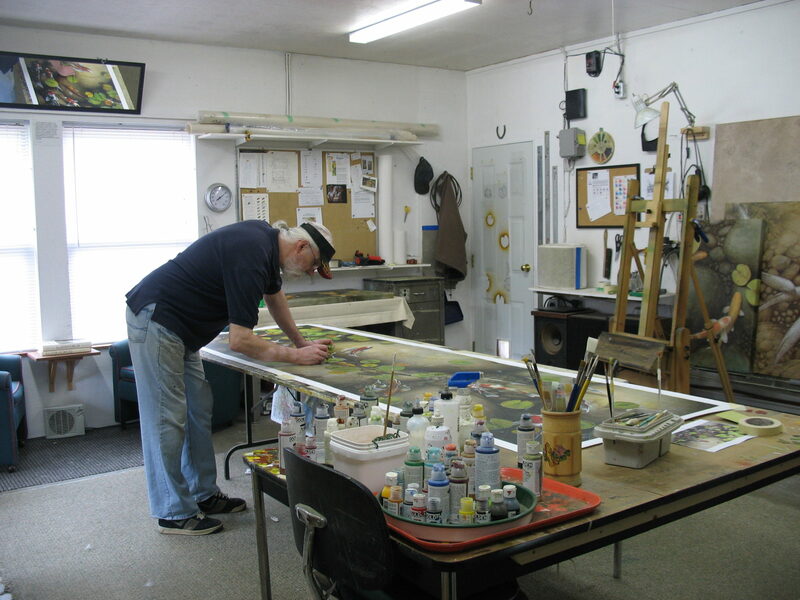 Through the years, there were many roads to explore and many new and innovative facets of the arts to learn…from large scale illustrated advertising production, to custom mural painting and specialty paint finishing techniques, and so much more in between. Many of those skills and techniques I either had to invent, or master on the way, have come together in their own unique way to become the art I make today. Although I did paint fine art on canvas almost from the beginning of my art career, I did not begin showing my art formally until about 1997 and was first published in the US in 2005. I have been in numerous shows and published in numerous magazines (which I appreciated but failed to keep decent records). I live and work in my home studio with my wife and long time muse Jo-Anne, on the beautiful west coast of British Columbia in Canada.